Hey there! You may be wondering what this indulgent strawberry layer cake recipe is doing on a paleo-ish food blog. Well…. it dates back to when I wasn’t a paleo-ish blogger, and it’s my FAVORITE white cake for birthday cakes. And it’s apparently one of your favorites, too, because it’s been flying around Pinterest like crazy for the past few years. Eventually I’d like to clean it up and make it (at least) gluten and dairy-free, but in the meantime it’ll stay and have a home here on my blog as totally-worth-it recipe we’d indulge in. It makes a pretty spectacular birthday cake. My little girl turned two a couple of weeks ago, and we had a bunch of her little friends over to celebrate (as well as their families. It was quite the shin-dig.) I needed a large cake so everyone could have some, and after the chocolate cake fiasco* from her first birthday, I wanted to try something in the fruity spectrum. 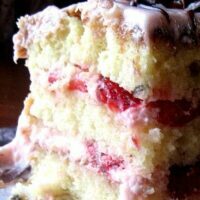 Plus Sophie’s crazy about strawberries so I thought she’d love this strawberry layer cake. *Last year she ate chocolate cake by handfuls, broke out in a rash from getting it all over herself, then threw it all up an hour later. Happy 1st Birthday! Hint: Refrigerating the cake for a few hours makes it LOTS easier to cut into layers. I also use a long bread knife which makes it easer, too. This was the first time since my cake decorating class over a year ago that I used my frosting bag and tips. Writing on cake is not my forte. Don’t even talk to me about cursive — think: Jackson Pollack. It’s a hot mess. Truly. Sophie is also crazy about butterflies, and those weren’t too hard to make. The cake turned out delicious!! I think it’s one of the best vanilla cakes I’ve ever had that wasn’t a pound cake. The frosting was fluffy from the whipped cream and had a hint of strawberry cream cheese flavor. After we refrigerated the leftovers and ate it the next day we decided that it was even better chilled. [Updated 5/2018] This vanilla cake has been turned into all kinds of things over the years — a coconut-frosted cake for my grandpa’s 80th birthday, a blueberry My Little Pony version for my 5-year-old, and a pink ombre rose cake for that same girl’s 9th birthday. See those chocolate frogs?? So cute, right? I just got an inexpensive frog mold on Amazon and used good quality melting chocolate. The inside layers were colors to represent all of the Hogwarts houses and layered with chocolate buttercream. This was probably the best job I did at getting all of the layers evenly sized. I used a 7-inch round pan and put 450g of batter in each layer. This strawberry layer cake has tender stacks of fluffy vanilla cake sandwiched with fresh strawberries and the best strawberry cream cheese frosting ever. For the frosting, beat cream cheese and butter in a large bowl until smooth. 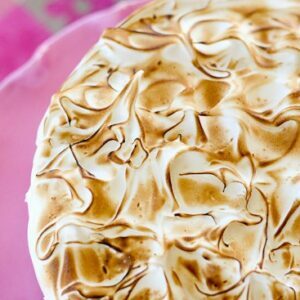 You'll probably want to use an electric mixer for this so you don't end up with lumps. Stop every now and then to scrape down the sides of the bowl. Beat in sugar, then jam. Beat cream in a separate, chilled, bowl until peaks form. Fold whipped cream into frosting. Cover; chill for a couple of hours until it's firm enough to spread. For the cake, preheat the oven to 325 degrees F. Butter and flour two 9-inch cake pans with 2-inch high sides. In a medium bowl whisk together flour, salt, baking powder, and baking soda. In a large bowl, cream butter and sugar together until light and fluffy. Add eggs, one at a time, beating after each addition. Beat in vanilla. Add sour cream, and beat for 30 seconds. 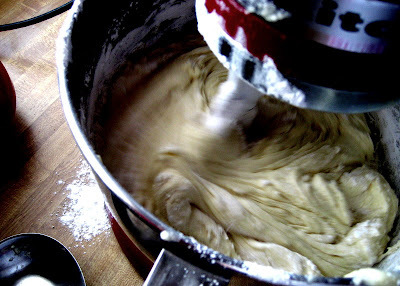 Add flour mixture in three additions, beating to blend after each addition. Divide batter into prepared pans. Bake cake until a toothpick inserted into the center comes out clean, 50-60 minutes. Remove from oven and cool for 10 minutes. Using a serrated knife, divide each layer in half horizontally. Place one half, cut-side down, on a cake plate. Spread 2 T of strawberry jam over the cake, then spread 3/4 c of the frosting over the jam. 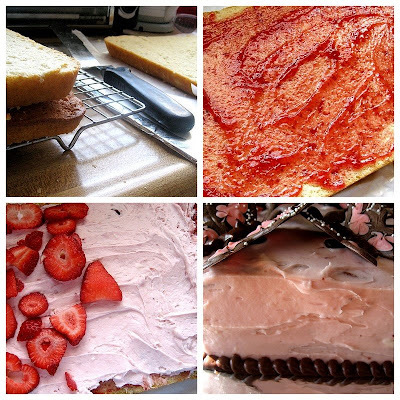 Arrange 3/4 c of the sliced strawberries on top of the frosting in a single layer. Repeat two more times with cake layer, jam, frosting, and strawberries. Top with remaining cake layer, cut side down. Spread two cups of frosting over the top and sides of the cake in a thin layer, then frost with remaining frosting. Stir remaining jam to loosen, then spoon teaspoonfuls onto the top and sides of the cake. Use the back of a spoon to swirl jam decoratively into the frosting. As you can see, I used a 9x13 cake pan and did three layers instead of four. This makes a LOT of cake. (Which seems to justify the pound of butter (between the cake and the frosting) and 7 eggs, no?) It fed well over 20 people at Sophie's party. It does take longer to bake that way. I think I baked it for an hour and 5 minutes or so. Begin the toothpick tests at around 55 minutes, though. Because I decorated her cake, I didn't swirl jam into the frosting. Holy Toledo, that cake is awesome. i LOVE those butterflies!! How lucky Sophie is!!! That cake was so stinkin awesome. That is my goal from here on out…actually make a cake for my kids’ birthdays (no ice cream social this year, and least not for the November birthday…hehe…what was I thinking). Maybe we can think of something else that is boyish that I can use your butterfly instructions for. I love this cake! Maybe JD needs to learn how to make a cake for MY birthday. You did a really good job with this cake! I have made this cake twice from the Bon Appetit recipe and I wanted to comment on it officially but could no longer find the recipe on Bon Appetit's website. This is a fantastic cake tastewise, but I have had the hardest time assembling this thing both times that I have made it. The reason is that the frosting, even after hours in the refrigerator, softens within minutes of being in room temp. With a 9×13 cake cut into layers, this was probably not a big deal for you, but if you have the 9" round cakes, the layers just slide all over the place as the frosting melts and oozes out the side. The second time I made it, I chilled everything, including the cake layers. When I put it together, it was better than the first time, but I still had to stick some cocktail stirrers in it to hold the layers straight while we carried it to a party. Anyway, it tastes FANTASTIC even if it looks a mess. Next time I am just doing a 9×13 with a thick layer of jam, berries, and frosting on the top. No layers for me! Add some unflavored gelatin to the whipped cream…. Cook’s Illustrated suggests that addition and I’ve had no problems with similar icings of theirs. I was just about the same thing about the geletin. Thanks for the heads up about layering 9-inch cakes. I've only made this cake once and it was as described above. I don't remember the layers and frosting being particularly slippery, but maybe that's due to the 9×13 layers. Huh. You did a beautiful job on the cake. Can not wait to make it for my family. Thank you. Hey! Is the “T” suppose to be teaspoons or tablespoons? Btw, beautiful job on the cake! The strawberry jam makes the cake extra sweet and generic. (of course this is my personal taste). Try it next time with layers of fresh strawberries mixed with a little sugar, then add the whipped cream on top. 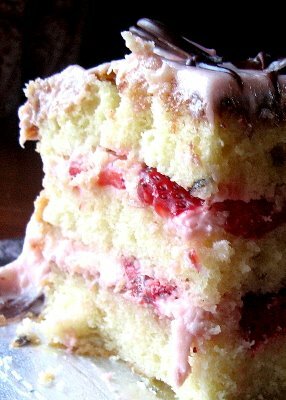 The cake will absorb the strawberry juices, making it very moist and fresh. I use Chantilly cream, made with crème fraiche ( I buy it in Whole Foods) . Try it, you will taste the difference. I agree with you somewhat. I didn’t mind the jam in the layers (because there are also fresh strawberries), but I didn’t like it all over the cake, which is why I didn’t smear it on the outside, like the recipe suggests. I’m not the most experienced baker, so pardon what might seem like a stupid question. Did you just use ONE 9×13 pan and cut it into 3 layers? Or 3 9×13 pans? That cake looks awesome, I can’t wait to try it. We’re looking for a really moist vanilla cake for my daughter’s upcoming wedding, this might be the one!! No, don’t be afraid to ask! I used one 9×13 pan and cut it into 3 layers. The cake is kind of dense, but it definitely helped to refrigerate the cake beforehand. This would be an amazing wedding cake!! Here is my trick… I used a 1/4 cup extra of strawberry jam that I sprinkled unflavored gelatin over. After letting set for 5 minutes I put the jam and gelatin mixture in the microwave for 15 second to melt the gelatin. Stir the warm mixture and let it come to room temperature. When making the frosting add this mixture to it. You will have the best frosting ever! Has anyone made it and froze it to serve at a later time? I’ve never done it, but I’m sure the cake would freeze just fine. I don’t know about the frosting, though. I’d just make the frosting right before assembly. You did a terrific job. Looks so yummy. I made something very similar after tasting such a cake filled with a variety of summer berries. The only difference is that I used whipping cream mixed in with melted semi-sweet white chocolate, a hint of vanilla. Because the chocolate was sweet, I didn’t need to add more sugar. I also used jam to moisten the cake before adding the layer of berries & frosting, thinning out the jam first by boiling it with a little water. The frosting ingredients and directions….heavy whipped cream? Is this the cool whip that is folded in or is it heavy cream in the milk section? The directions say to add the cream and then to fold in the whipped cream? I think I’m missing something. 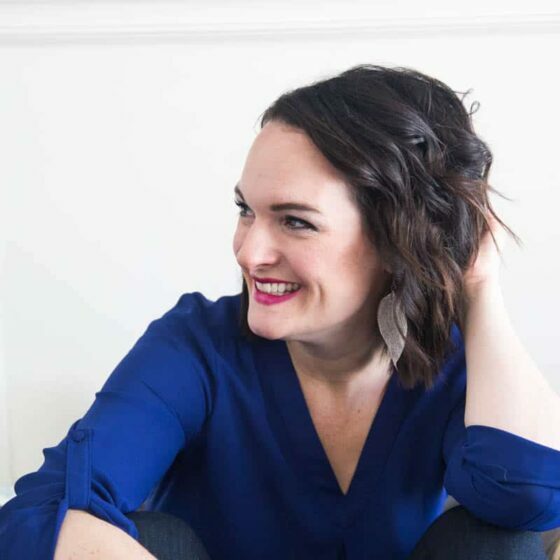 Hi Rebecca — Sorry for the confusion! This is the liquid heavy whipping cream, not cool whip. The directions say this: “Beat cream in a separate, chilled, bowl until peaks form. 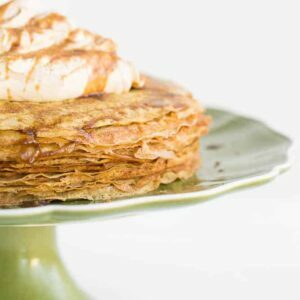 Fold whipped cream into frosting.” As in… beat the heavy whipping cream, and then fold THAT cream into the frosting. It’s the same cream. I just made this, and it was AMAZING! I loved the frosting and the taste of the cake itself. It was moist and yummy. I used 9 inch cake pans and I had a hell of a time assembling it. I finished the frosting, admired for a second, and then yelped as it all started melting apart! None the less, it was delicious! I will def make this again in a 9 X13 pan. Oh no!! That seems to be the consensus… 9-inch rounds are a doozy to assemble. At least it tastes great, right!? I’ve made this cake 3 times and use two 9″ round pans. What I do though is I cut each cake in half vertically, making it a thin 4 layer cake. I made this cake for a church fundraising auction and it went for $140, it’s a great recipe, and a favorite of mine, I look for any excuse to make it. OOPS!!! HORIZONTALLY!!!!! And I don’t swirl jam on the icing either. Have you ever made these into cupcakes or mini-cupcakes? Loved the recipe and looking to make it for an event but cupcakes would fit our crowd much better for simplicity. Just wondering if it would be too dry or if you had recommendations on bake time. I assume it would work alright, but I’ve never tried it, so I can’t give any accurate recommendations. Sorry that was meant to be it’s own comment, not a reply on yours! 1 lbs of butter. wow. this looks too good not to make. Found it on Pintrest and it looks sooooo good. I’m planning on making it for my daughters 2nd Birthday party later this month! I also saw this on Pinterest! I plan to make it for an upcoming company bake-off! It looks absolutely delicious! Ok, just made this… Waiting for it to cool so I can use the amazing frosting, can’t wait to try it….. Thanks for all the helpful comments.. I plan on trying this cake in the very near future. When I make boston cream pies, I cut my layers for my cake w/ sewing thread. Done while cake is still very warm. The thread glides right through the cake just have to keep it even. What a great idea! Thanks for that awesome tip. My mom taught me that trick when i was little..im 41yrs young now. I used to think it was sooo neat. It glides right thru the cake…she used to do it to thake the hump off the top of round cakes so after its frosted the second cake would sit flat on top of the other cake. Not sure what I did wrong but after 2 days in the fridge the icinf still did not get spreadable, only pourable. It was like pudding.I even added an extra 4 cups of powder sugar to it hoping that would thicken it up but it didn’t. The taste was good, just couldn’t put it on the cake. Had to put a spoonful on the plate next to the cake slice and dip the cake into it. 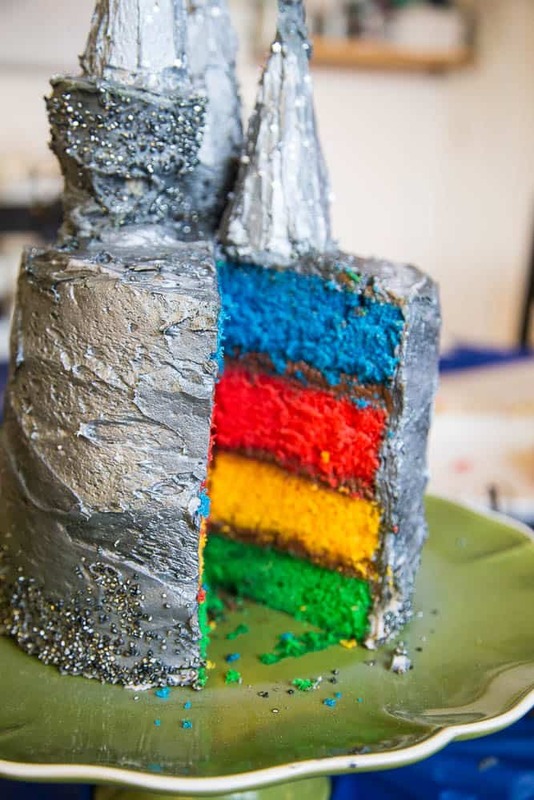 I can’t wait to try making this cake. My family is incharge of Easter dessert and am sure this will be a hit! Thank You! Loved reading all the tips and tricks in the comments. 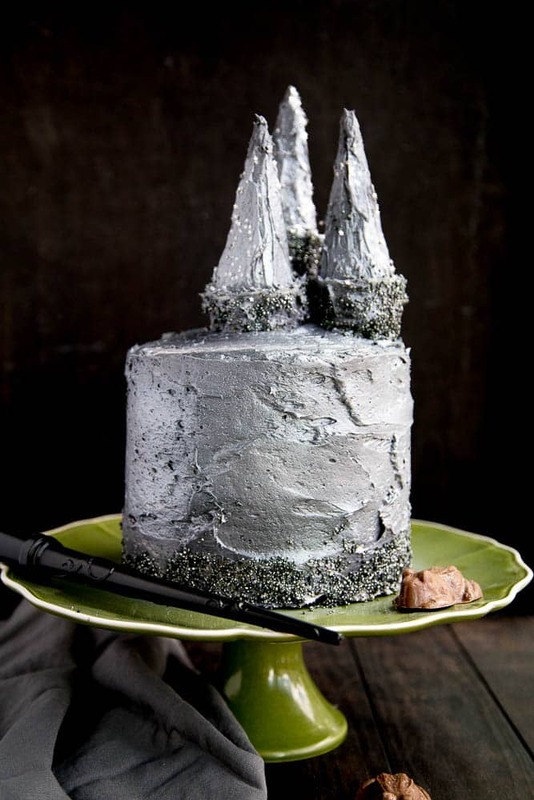 I found this cake on Pintrest. I’ve never made a cake from scratch before but here goes . . .cake is out of the oven and just flipped out of the pans for cooling. They don’t look too white, more of a yellow cake look to them. I’m going to hold off on frosting them until tomorrow before company comes. I know, why would I try all this for the first time and expect to serve it for Easter . . . it looked sooooo good on Pintrest I just couldn’t resist. I hope I don’t have the same frosting issues that some of you have had. I did use the 2 9 inch pan method. I’ll post how it turns out later. I just made this cake for Easter dinner tomorrow. I baked a 12″ and tiered it with a 9″ cake. The frosting started to melt in the middle of the assembly and it slippery. The declaring looks a little “messy”, but the taste is amazing. My husband even loved the left over frosting over the left over strawberries as a dessert! Happy Easter! OMG!!!! I just made this for Easter (tomorrow) SO SO SO GOOD!! I had to try some…… YUUMMMMYYYY!!!! WILL MAKE THIS AGAIN AND AGAIN!!!!! I just made this for Easter tomorrow. I used two 9 inch pans and I also used the sewing thread to cut the cake in half when it was warm. Worked like a charm. I made sure the frosting was cold. I didn’t put the cake in the fridge because my wire rack was too deep to fit. So I waited until the cake was room temp before assembly. It went together really well, I didn’t have any major issues. I did notice by the time I got the 4 layers put together and it was time to frost around the outside of the cake, the frosting was not very cold and slid off the cake more. I had to work REALLY fast and get it in the fridge. So I would recommend maybe putting the frosting back in the fridge for about 15 minutes or so and then frosting the outside of the cake. I also left jam off the top layer because I saw a comment above about it being too sweet that way. Tomorrow I will shave some dark chocolate on top and decorate with strawberries. This was pretty easy, and not many steps, but be prepared to spend some time on it! Thanks for the recipe! I can’t wait to show it off tomorrow (and then eat it, of course!). Just finished frosting the cake. Thanks to my dear husband – he’s the artsy one in the family. Got the frosting on and put it back in the fridge till after Easter dinner. It looks a little messy, started to slide around a bit but that’s the beauty of it I guess. It certainly looks homemade ;) I can’t wait to taste it now. I dipped a few of the strawberries in the left over frosting and it tasted devine. Thank you so much for sharing this with us. Happy Easter to everyone. wow-what a great idea if you don’t have time to make butterflies-just dip the berries and put on top-yummy!! Made this for Easter and now my husband wants this for his birthday! Best cake! Huge compliment that he is requesting this over his all-time favorite…red velvet! I made this cake last night at a customer’s request and it is fabulous!!! I followed the recipe exactly this first time, but can see many variations of it working!!! I made it as a 1/4 sheet and only cut it into 2 layers, but can see how beautiful it would be as a round or square cake with several layers of the jam, frosting and fresh strawberries!!! What a wonderful spring/summer cake!!! Thanks! You’re welcome! Yes… you can do a lot of things with this! My 4yo wants this cake again except with blueberries. I’m excited to see how it turns out :) Glad you enjoyed it! Oh my! I pinned this one a while back and just finished it for my daughter’s 5th birthday party tomorrow. I baked the cake last night and put it in the fridge until tonight. I had the frosting in the fridge for about three hours before frosting the cake and didn’t have any issues with it sliding. It turned out great and we enjoyed eating the “cake scraps” with a dab of the frosting. My husband says this is now my “go to” yellow cake. It has the best combination of moistness and density and the flavor is outstanding. The whipped cream in the cream cheese frosting is the best! We went to put the cake in the fridge and it is SO heavy! I piped melted chocolate flowers on the sides and wrote on the top and it looks darling. I can’t wait for e eryone to enjoy it tomorrow! Thanks for such a great recipe!!! So glad it worked well! I was getting nervous with all of the comments about the frosting being too runny. *Phew* Enjoy tomorrow! I’ve heard so many good things about this cake! I teach and make cheese so I have a big batch of freshly made cream cheese to use for this recipe. My son’s 3rd birthday is on the 5th of May so I think he’ll love it. I made this cake for a birthday party yesterday, and it was A) so easy, and B) INSANELY DELICIOUS! Thank you! I will definitely be making it again! I made this cake this morning, with a few variations. 1) Instead of 2 tsp vanilla extract, I used 1 tsp vanilla extract and 1 tsp almond extract. 2) I made 3 layers and didn’t cut them in half. 3) I used raspberry preserves (strained, so seedless) and frozen raspberries, instead of strawberry preserves and strawberries. Has anyone tried to just leave it as a single layer in the 9×13 pan? This looks heavenly!! There can never ever be enough desserts with strawberries. Yum! I am making this cake right now, and it smells HEAVENLY! I can’t wait to put it together for my mom’s birthday party later! I haven’t decided what to do about decorations…probably something simple. I have a feeling that I have an awesome new GO TO vanilla cake! Thank you!!! Thanks Alot. Can I use buttermilk or yougert instead of sour cream? I’d use Greek yogurt if you’re going to substitute. Buttermilk doesn’t have the same texture as sour cream. Good luck! Looks yummy and can’t wait to try. To cut the layers, I use dental floss…much sturdier and works well. Hey! I made this cake today for my daughters birthday, and it is amazing. I did a 3 layer round cake, and had to keep refrigerating the frosting and cake, because the frosting is runny, and the cake was melting. But the frosting is so good! I only used one container of strawberries, because my daughters ran off with the other container and ate every last one! But it worked out. :) Thanks for the recipe! This cake was very good and rich. I did the four layers with the round cake pans. Before cutting the two round cakes in half I did put them in the fridge and it helped. I did make the frosting ahead of time and no matter how long I left it in the fridge it never became any thicker. It was still yummy just not picture perfect and I had quite a bit of icing left over so I just froze it. I “pinned” this recipe months ago with my daughter’s 8th birthday in mind– she LOVES strawberries! We had her party yesterday and it was a huge hit!!! Delicious and beautiful!! The icing is heavenly!! It was a show stopper! Made this last week and OMG. Everytime my boyfriend eats a piece of it he says this is the BEST cake I have ever made. Thank You. I was just wondering, I want to make a round cake instead of a square one. I know that it won’t be as big, so how much less should I use? I’m sure I will have a lot left over if I use the whole 7 eggs and what not. Help please! Hi Shelby! Just use three of those standard, round cake pans. That’s what the original called for anyway. Best of luck! Another question, do you have to use a beater or electric mixer? Or can you just hand mix it? Sorry for the late reply! You could mix it by hand, but I would highly recommend a mixer (or a hand-held mixer) so the ingredients can be incorporated fully. This cake was absolutely awesome! I made this for my mother in law’s birthday yesterday. I did it as a 9 inch round stacked cake. I didn’t have a big problem with the icing sliding around, I did however, stick the cake in the freezer after I had iced it to let it harden just a bit. Probably 25 mins. Then I took it out and put it in the fridge until time to celebrate. I will make this cake again. It was incredibly delicious. Loved it! Probably one of the best-tasting cakes I’ve ever made! Hello!! Your cake looks delicious!! I am actually doing a chocolate ganache frosting, but am very excited to use your recipe as my cake!! Quick question, can I use Fage Greek yogurt in place of sour cream? Yes! I think that would work just fine as long as the yogurt is full-fat. Hello! I’m wondering if the ingredients’ measurements listed are for 12 people or for the size of the cake you made for your daughter. I will be making the cake right now. Thank you! I suppose I should also mention that I live on the prairies and its the middle this time of year! Does it make a difference if I use splenda instead of sugar? I made it with splenda and it didn’t rise at all. That’s the only thing I changed in the recipe.. I guess its a good thing I tried it before Easter dinner. Hi Kim. I’m sorry it didn’t work! I do not buy Splenda so I’m not familiar with its effects in baked goods. oh, also I didn’t have any unsalted butter on hand because I usually use salted butter, I hope it doesn’t make too much of a difference.. I made this and took it to work. It was a huge hit! I put jam in the icing but made a strawberry purée, ran it through cheesecloth and added grand marnier & sugar (to taste) for the genoise. I had no problem with assembly by keeping everything chilled prior to and during putting it all together. This method works if you do not want to add gelatin to the frosting as mentioned earlier. Putting it in the freezer for 20-30 minutes afterwards, then storing in the refrigerator until time to cut helped keep it all together. I also made a second cake and exchanged half of the regular sugar with light brown sugar, as well as adding 1 Tbsp of vanilla bean paste to the vanilla already called for in the recipe. This gave the cake a lovely richness to the taste. As a previous comment said, there are all kinds if possibilities with this cake. However, the adapted recipe is a real keeper just as it is. I highly recommend adding this to your favorites! 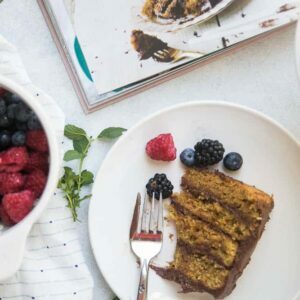 Hi, I’m wondering if this cake could be made with raspberries instead of strawberries? I didn’t have problems with the frosting, but many people did. 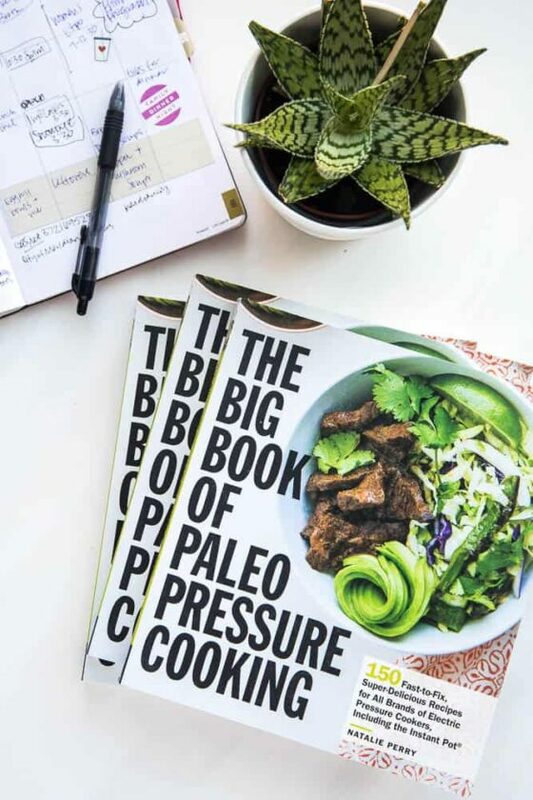 If it worries you and you’re comfortable adapting the recipe, then go for it! I made this cake yesterday for my daughter’s 8th birthday, complete with the chocolate butterflies. It turned out really cute and the butterflies were not nearly as difficult to make as I feared. I do think the recipe needs a little tweaking, though. First of all, I used two 9-in rounds as the recipe stated and they were so full, by the time the middle was set, the outside was much darker than I would have preferred, resulting in a somewhat dry cake and portions that had to be shaved off. Second, the frosting. I have made cream cheese frosting numerous times for different cupcake and cake recipes and not a single one called for whipping cream. The cream cheese already makes the frosting so soft and unstable, I just can’t see how it would even be possible to work with it with the addition of cream, even if it was thoroughly whipped. So I left out the cream, making a standard CC frosting. Also, the best tip I’ve come across with regard to CC frosting is to make sure the cheese is VERY cold when mixing up the frosting. The butter can be at room temp, but the cheese needs to come straight from the fridge. Even with my adjustments, I still had to keep it refrigerated before, during, and after the cake was assembled, which I feel affected the overall taste since the cake was served cold instead of room temp. My daughter was happy with it, and while I will definitely make the butterflies and maybe the overall style of cake again, I think there are other recipes that are a little easier to work with and just as good. Yummy! I had to try this cake as soon as I saw the picture. It was so incredibly good! The butterflies you made are amazing! Definitely going to make this again. It was a huge hit with the whole family. And yes, I used chocolate frosting for the writing. Hi there! I was wondering if you think this recipe would be suitable as cupcakes. Thanks! Love this cake and made it last year for Mother’s Day. I just made it again, and darn it, thought it said 2 eggs. I was looking it over again after I put it in the oven, and saw it needs 7! Do I start over?? I made this cake and it was a huge hit! My husband said best cake ever!! Going to try making cupcakes with same recipe to take to a picnic. Thanks. I’ve made this several time and love it! Question: If I wanted to use almond extract would I use it an addition to some vanilla or instead of? And would the conversion be the same, 2 T? Thanks! Note to self. Used cream cheese straight from fridge. Used almond instead of vanilla. Used 2 – 10 inch pans. Used cold water soaked, bake-even strips on cake pans. Baked 50 minute. Sliced strawberries with egg slicer, single layer on paper towel to dry. Also, pat dry top side with paper towel. Could use 3/4 of icing recipe, makes a lot of icing – or could just use more icing between layers. Also, put some icing on plate before adding the first slice of cake. I have made this cake for several events since you posted it! It is my very favorite cake!! Great cake! Did someone mention on here that the cake possibly sinks in the middle, otherwise it was very good. I thought I read it somewhere, but can’t seem to find it. Maybe it was another recipe. Strawberry season is upon us once again and I prepare to make this fantastic cake for the third year in a row. I look for any excuse to bring cake do events during the spring. There’s usually a good bit of frosting left over. It’s delicious on crackers (think sweet/salty), on fresh baked bread or plain. 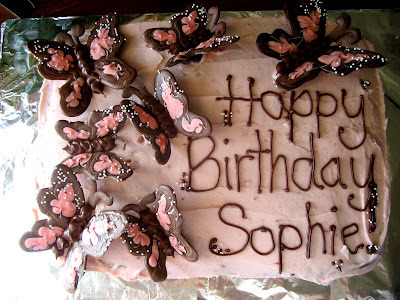 The butterflies also look so elegant and leave me marveling at the delectable and beautiful cake. Note- raspberry preserves/fresh raspberries can be subbed for strawberries. I’d recommend decreasing the sugar in the frosting though because raspberry preserves seem to be a good bit sweeter than strawberry. WARNING This might be blasphemous for some of you. For a one layer 9X13 pan, I halved the entire Frosting recipe (I still had some frosting leftover). Then I bought a box of Duncan Hines Vanilla cake batter, made as directed on the box and just added the jam and the berries as indicated in the recipe above. Still takes some time but I think significantly less. It was so moist and delicious and is my husband’s new favorite. I think this would be great with fresh strawberry slices sprinkled on top as well. One day, when I’m feeling particularly adventurous, I will try to do the whole recipe from scratch. I made this recipe a few years ago, then lost the recipe and I found it again! I’m so glad to have found it, because I want to make it again for my daughter’s birthday! I’m going to try this for my little girls first birthday and the LOVEs strawberries. Do you think I can puree or dice strawberries and put it into the actual cake …or is that a step too far? This came looks so delicious. I don’t often make cakes but I would love to start. I have one question. When you slice the cakes in half (I’ve heard plain, unwaxed, unflavored dental floss is a good tool), and you say “place cake side down”, what does that mean? It’s all cake. Did you mean cut side down? Or the opposite? Thanks for your time! Can’t wait to try this recipe! Ack, yes. CUT side down. Thanks for catching that! Hi! Can I substitute the strawberries with mangoes ? I’ve never made it like that, so I can’t say whether it will work well or not. Mangoes have a higher moisture content, so I’d keep that in mind for sure if you try it out. hello, so I have made this multiple times but never printed the recipe. Well since the update there doesn’t seem to be an ingredient list. So, now I am really bummed since I love your recipe, but can’t find it.